This briefing document was prepared under WWF’s low carbon frameworks transport project, which seeks to document the different sources of emissions from the sector, and to explore the implications of greenhouse gas emission reduction strategies. 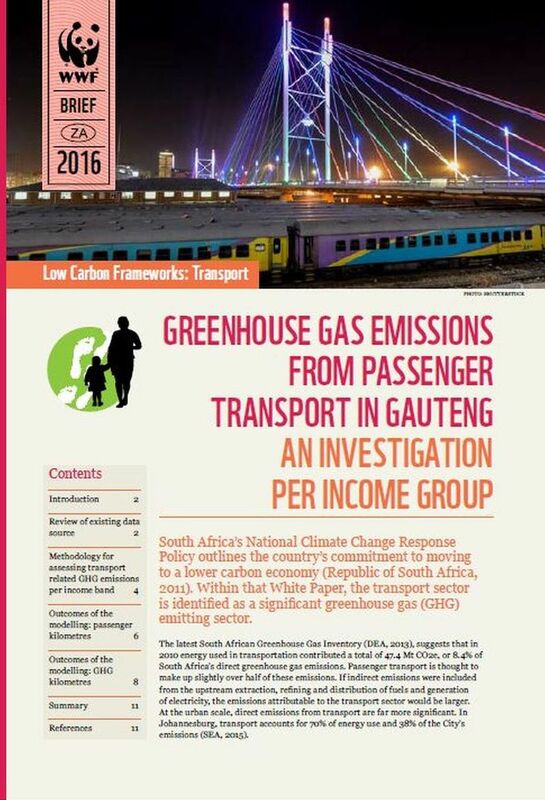 It provides an overview of passenger transport demand and greenhouse gas emissions in the passenger transport sector, using Gauteng as a case study. Given how demand for transport, possible intervention strategies and thus the opportunities for mitigation, differs between income levels, an attempt is made based on available data to unpack passenger kilometres and emissions according to income level. Gauteng is selected as a case study for two key reasons. Firstly, it is the most populous province and hence has the largest share of transport emissions. Secondly, there is a substantial amount of information available on passenger transport and associated emissions, which has been gathered through transport surveys, transport planning efforts and associated modelling. In a separate paper, the mitigation opportunities, initiatives and measures available to the passenger sector are summarised. This is one in a series of publications produced by the Transport Low-Carbon Frameworks programme.